Here at the Garden Professors we pride ourselves on being on the cutting edge of technology. In fact, we’re so tech savvy we didn’t even whine when FaceBook foisted a new homepage format on us for no apparent reason. So it’s only fitting that we offer you, Mr. and Ms. Garden Professor Blog reader, an opportunity to participate in the first ever landscape horticulture research project designed by social media. Here’s the deal. My current research project on water and nutrient management of trees in container production has left us with over 100 ‘Bloodgood’ London planetrees in 25 gallon containers. What I need from you are ideas for a study plan on what to do with the trees next. Of course, as with any major research project, the first step in the rigorous scientific process is to come up with catchy acronym for the study. I propose “the SOcial MEdia DEsigneD TRansplant ExpErimental Study” or SOME-DED-TREES for short. Needless to say, I am willing to consider alternatives. In any event, we have a unique opportunity to investigate post-transplanting growth, development and physiology of landscape trees. So here’s what we have: Approximately one hundred, 2” caliper trees, grown in containers in a standard mix of 80% pine bark and 20% peat moss. Trees have been grown for two years in essentially standard nursery culture – daily irrigation and 60 grams of Nitrogen per container. The subject of the original study was fertilizer source; half the trees were fertilized with Osmocote and half received the same amount of nutrients from organic fertilizers. After two years we have not seen any difference in growth or foliar nutrients between the treatments. Nevertheless, I will need to include the prior treatment as a blocking variable to eliminate any potential confounding effects. Beyond that it’s wide open. We could have 6 treatments x 2 blocks x 8 trees = 96 trees. I strongly suspect in the final analysis the block effect will be non-significant and we can consider there to be 16 replicates, but life is full of surprises. So, what tree establishment or tree care question is burning a hole in your brain? “Shaving” or “butterflying” container rootballs? Fertilizing at time of transplant? The latest biostimulant? Crown thinning at time of transplant? Frequency of post-planting irrigation? Width of the planting hole – how wide is wide enough? Send me your suggestions and we will set up a poll to vote for the top choices. Posted on September 26, 2011 Author Bert CreggCategories UncategorizedTags nutrients, planting, water7 Comments on Be a Part of History! Given my concerns about excessive phosphate loading in urban soils, I contacted Dr. Rich Koenig, an urban soil scientist and chair of WSU’s Crop and Soil Science department. I wondered, at least, if the article should have directed people to have a soil test done first to determine how much phosphate was already in the soil before adding more. Dr. Koenig was likewise concerned that the application rate of fish meal was probably far higher than what plants would require, thus increasing the risk of phosphorus leaching and runoff. He also referred my question to Dr. Jim Harsh, a soil chemist in his department familiar with the process described in the article. And as Dr. Harsh pointed out, it’s important to make lead less susceptible to uptake by people and other animals exposed to contaminated soils. However, he’s unconvinced that phosphate is the best choice; in fact, research by Dr. Sally Brown (cited in the NYT article) and others (including Dr. Harsh) have found that compost containing iron is also able to bind and immobilize lead. The advantage of high iron compost is that iron will not leach into nearby waterways, nor cause the same kinds of plant toxicity problems, as phosphate can. Thanks to both Dr. Koenig and Dr. Harsh for their quick and informative responses on this topic. Ever on the lookout for interesting plants or plant problems, I found many of our native species with definite signs of interveinal chlorosis. This is indicative of a foliar deficiency of iron or manganese. These forest soils are rarely deficient in either nutrient, and they also tend to be acidic (meaning that it’s easy to take up iron and managanese; alkaline soils inhibit uptake). So why are these native plants, naturally growing on native soils, showing iron and/or manganese deficiency?Answer on Monday! In early December, I posted my thoughts about fertilizing crops vs. landscapes. An anonymous reader asked if we could follow up by discussing the relationship between excessive fertilizers and plant susceptibility to pests and disease. It’s taken a month to get the scientific literature (and my act) together, but here it is. There are decades’ worth of articles about the direct relationship between increased nutrient availability and increased susceptibility to pests, disease, and disorders. One of the earliest articles linked the incidence of celery blackheart to over-fertilization. Since that time, researchers have found similar causal relationships in vegetable crops such as rice, onions, and soybeans, ornamental crops including poppies, and perennial orchard crops such as nectarines. Unfortunately, there’s been no research on landscape species. Happily, the way plants react to excess nutrient levels is generic – so we can apply the findings in the agricultural literature to landscape situations. Just like kids and candy, plants will greedily take up all the available macronutrients their roots can find, especially nitrogen and phosphorus. (It makes NO difference is the fertilizer is organic or inorganic.) Plants in highly nutritive soils respond with lush vegetative growth – and fewer flowers, by way. Less metabolic energy is put into protective compounds, so these succulent new leaves and shoots are prime targets for all kinds of unwanted plant-eaters and foliar pathogens. As with so many things in life, moderation is the key. For routine landscape needs, use woody mulches rather than fertilizers and nitrogen-rich composts. This “slow food” approach not only benefits your plants, but provides ideal habitat for mycorrhizal species, which have been shown to help restrict root uptake of excessive nutrients, while assisting with uptake of less available ones. 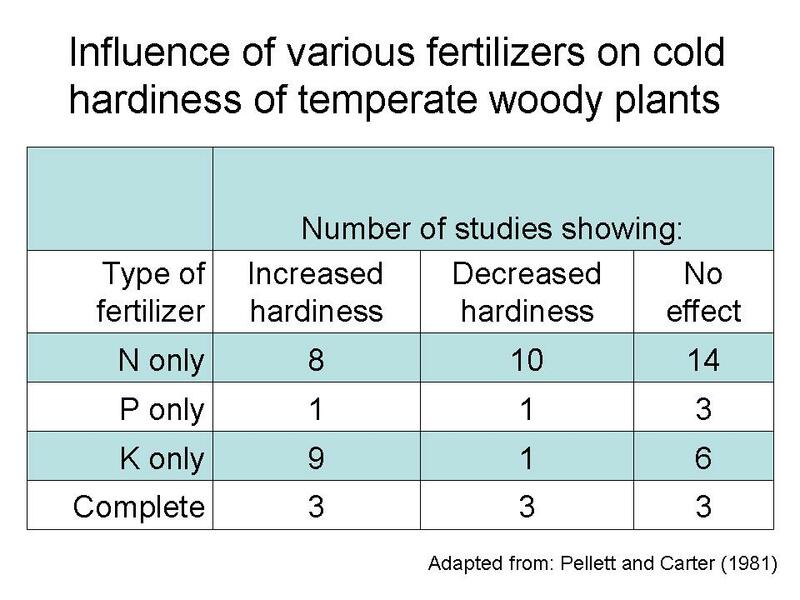 Last week Jeff wrote about the dangers of using “balanced” fertilizers, especially in reference to phosphorus content. Comments quickly followed about using fertilizers in many situations – on farms, in container plants, on trees – and so on. One of the latest comments came from Nick and began “I don’t usually recommend fertilizer for perennials or woody plants to consumers. In most cases they aren’t needed.” And this leads into today’s topic. Many of the horticultural practices we use in our gardens and landscapes have, unfortunately, been derived from agricultural crop production. Whether you’re growing a field of wheat, garden tomatoes, or containerized shrubs your goal is maximizing crop production. By its nature, this is an unsustainable practice because it requires continual inputs of water and nutrients at higher levels than would naturally occur. But this is not how you should care for landscape trees and shrubs, and why Nick’s comment was a good one. You don’t need to routinely add fertilizer to these plants; they don’t need it to grow normally. What we should be doing in landscapes is preventing nutrient deficiencies. Once you have a soil test in hand, you’ll know what nutrients may be too low (or too high) and how soil pH will affect that. For most of us, this may involve occasionally adding one of a few nutrients (most commonly nitrogen), or perhaps acidifying the soil to improve nutrient availability. How do you know when to add nitrogen to established landscape plants? Let your foliage do the talking. 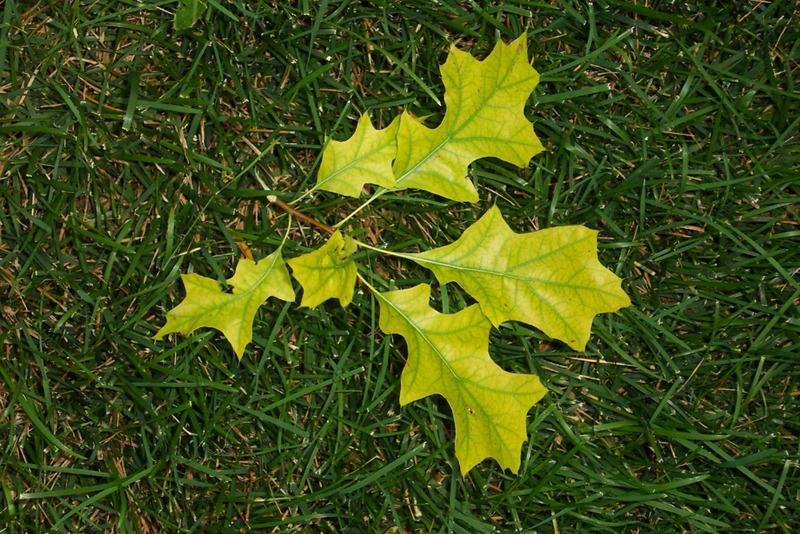 If leaves are uniformly yellow, small and sparse, you might have a nitrogen deficiency. This will be most common in the mid to late summer, when plants are growing most rapidly and competing with one another for resources. Be sure this symptom is wide-spread, however. If it’s just one plant showing deficiency symptoms, it’s probably not a landscape issue. When I first started reading extension recommendations for plants around 15 years ago now, I read a lot about “balanced fertilizers”. Today I still see balanced fertilizers recommended, but not nearly as frequently, which is a good thing. these numbers). Although it might seem like equal numbers would mean equal amounts of these nutrients, these numbers actually indicate percent Nitrogen, percent P expressed as P2O5 (in other words, if you took all of the phosphorus present in the fertilizer, made it into P2O5 and then added it back to the fertilizer and figured out what percent of the fertilizer that made up — that would be the second number) and percent potassium expressed as K2O (basically the same as the phosphorus example you saw previously). But here’s the problem. The amount of phosphorus, and often potassium, that is added when you use a balanced fertilizer is typically out of line with the amount that the plant needs. This is because fertilizers are usually applied based on the amount of nitrogen that a plant needs. The reason that a balanced fertilizer was usually recommended was that phosphorus and potassium levels in these fertilizers is high enough that they provide all of those elements that a plant needed without being toxic to the plant. The problem is that, while the levels of these nutrients added might not be toxic, they are in excess of what is usually needed. 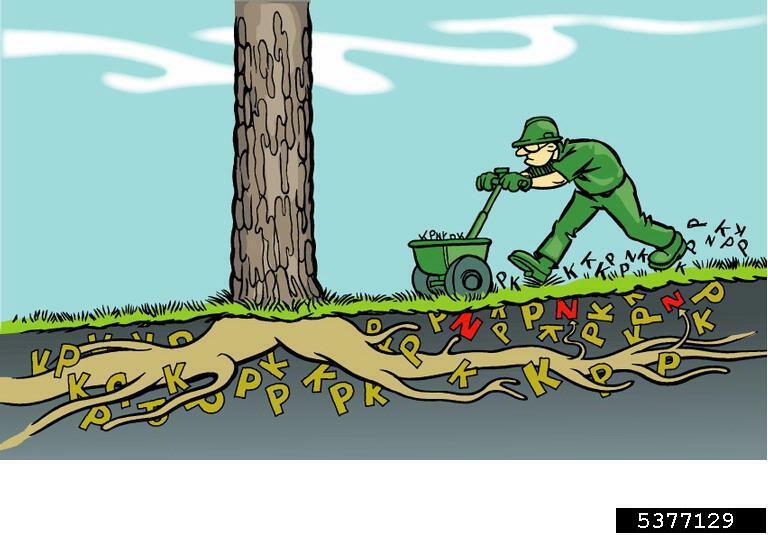 OK, so we’re adding excess phosphorus and potassium, what’s the problem? Well, for the potassium the problem isn’t usually that big a deal. In fact, a fertilizer bag with the first and third numbers equal may be what’s called for in many cases — fruits and nuts in particular often like a higher level of potassium. Additionally, the world has a pretty big store of potassium so we’re not likely to run out any time soon. Phosphorus, on the other hand, is a little bit different. Phosphorus is a bit more hard to find in large quantity than either of the other elements in a bag of fertilizer. Because of this it is often the element that limits the growth of plants, for example algae. When phosphorus runs off into a lake or other body of water it can allow algae to go crazy and use up all of the oxygen in the water killing fish and other creatures (actually it’s the dead algae that do this — bacteria use oxygen while breaking the algae down). Most of you are familiar with this and know that it’s the reason why Minnesota and now Wisconsin have banned the use of phosphorus fertilizers on lawns without a soil test. So conserve our natural resources and skip the balanced fertilizer. When asked for a general use fertilizer recommendation I usually recommend something with a ratio of roughly 5-1-2, with a higher potassium content if you’re growing fruits or nuts.